I have a very clear memory of being about 8 years old on a Sunday afternoon in the kitchen of the NC homestead where my Grandparents and Great Aunt lived. We were “making a party” which is what happened on lazy Sunday afternoons after dinner. My Grandmother, Aunt Grace and I were assembling platters of cookies to serve whomever happened to have gathered that afternoon in the front sunroom. Thinking back, I sometimes wonder if this really happened, but when I reported it to my Dad later that day, he just chuckled. Oh Aunt Grace. Amy Chua would call this moment crucial in my development because it would ostensibly give me the necessary Superiority Complex one needs to ensure my personal success. What was confusing about Aunt Grace’s secret wisdom to me was that we Edmistons were all Sober Presbyterians who had been taught to shun ostentation, sacrifice ourselves for our neighbors, and consider ourselves miserable offenders against God’s perfect law. 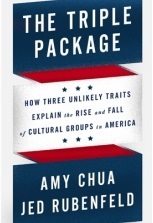 Amy Chua would consider this helpful as well because it would give me the also necessary Inferiority Complex needed to succeed. The Edmistons fell short when it came to the third piece of The Triple Package: Impulse Control. Hence our love of cheese straws and merengues. And cake, pie, ice cream, and – occasionally – more potent addictions. As I posted elsewhere recently, I’d give good money to see a debate between Amy Chua (who infamously wouldn’t let her daughters have sleepovers as children) and Brene Brown (who calls herself a Shame Specialist.) The Chua-Rosenfeld daughters have both been accepted to Harvard, so hurray for them. Honestly, that is a worthy goal along with financial prosperity and healthy cholesterol levels. And I’m okay with families who choose to raise their children in intentional ways that are not like the way HH and I have intentionally chosen to raise our children. We are all trying to figure this out in our own ways. Our family has a different Triple Package, I guess. We believe that our children (and yours) are created in the Image of God. We also believe that neither we nor our children (nor you and yours) are God. And I suppose the third characteristic of our child-raising was that following Jesus is the best way to live. So there you have it. A desire to make the world on earth as it is in heaven because that’s what we were created to do and be. This kind of life leads to a different kind of success, if you ask me.